The Comprehensive CAT5e 350 MHz Assembly Cable is used in enhanced Category 5 high-speed cabling to distribute data, voice, and video to meet the requirements of advanced fast Ethernet and gigabit computer networks. 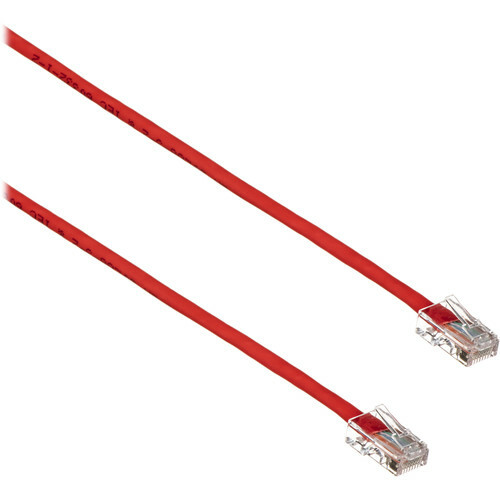 This cable is 14 feet long and will handle bandwidth-intensive applications of up to 350 MHz. Meeting Cat 5e TIA / EIA standards, it offers lower impedance and structural return loss (SRL) when compared to a standard 100 MHz cable. To keep Near-End Crosstalk levels to a minimum, Comprehensive has designed this cable with a shortened body plug without a boot. Furthermore, it has a red PVC jacket so you can color code your network installation.